Wow, look at the radical new airbox. That is the first thing that strikes me completely. It’s out of this world, never seen such a design concept before. My guess is it will reduce the frontal area. And with the reduction of the frontal area, perhaps this would result in better air flow to the rear wing. Well, that is just my hunch anyway. Lotus Racing’s quest for 2 seconds extra. 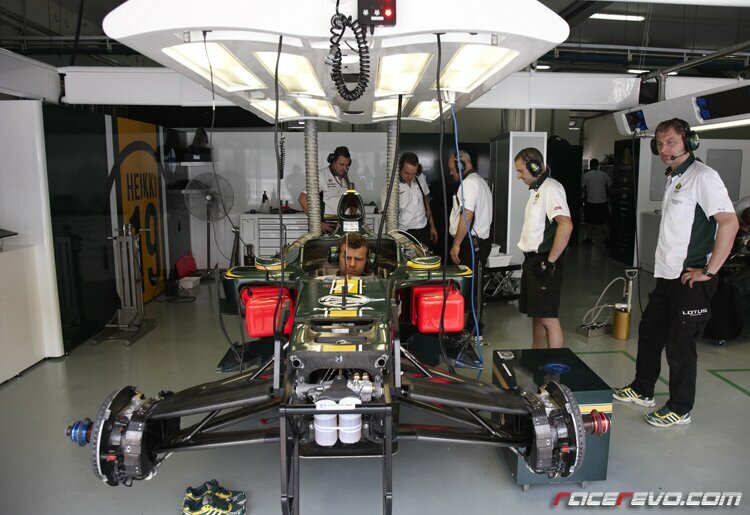 A behind the scenes look at the new parts Lotus F1 team is putting on its car for the Spanish Grand Prix aimed at improving performance. Courtesy of James Allen. The moment he put pen to paper with Mercedes to challenge Formula One this season is also the moment of frenzy in the world of motor racing. It seems even the news of Alonso’s transfer to Ferrari paled into insignificance at that time. Suddenly people stop talking or listening to other news. The ever so popular Lewis Hamilton had been condemned to the sidelines. The big shining star had emerged from the sky to regain his kingdom. The Box is a special dedicated place for the teams where outsiders are off limits. Basically we have no clue to what is happening behind the scenes on a grand prix weekend. Well not always, Ferrari have put up a rare video on exclusive journey to the Ferrari box, discovering the work on the car before, during and after the track sessions. Force India have caught our attention from time to time establishing themselves as a serious contender in Formula One. So we look back on the timescale and investigate where it all began. Previously you would think Jenson’s move to McLaren was a suicidal one. He proved you wrong and twice in the rain performed better than the highly regarded rainmaster Lewis Hamilton. All in all, Shanghai has produced the best race so far..
With the end of fly away races, three weeks gap to European races is the perfect opportunity for teams to find that extra tenths in the wind tunnel and reflect on technical decision that they have made before in the previous Grand Prix. The result? Most of the time is a major revision on the cars come Barcelona. Generally, European races are the the races of development. It is the name of the game, a cat and a mouse game. Or a game of copy or be left out. Another thing to note is, beginning from the European races, media and pundits alike will soon be establishing facts and figures more concretely. So what technical updates to expect in Barcelona? These are my findings..